If we consider the long-term delivery trading like a cricket test match, then the intraday trading is like 20-20 match. Yes, it is a fast game where you have very little time to decide. Quick reflexes and fast reasoning ability are two fundamental characteristics that make the intraday trading successful. An intraday trader has to possess a clear understanding of how a stock is trending and when the things turn worse? To have a stronger grip over the subject; Exponential Moving Average or EMA is a useful way to gauge the market trend. Since it is a chart, anybody can scan it quickly and understand quickly. When you look at EMA, no further analysis is needed. It gives to-the-point information cleanly and precisely. Since timing is crucial in the intraday trading, EMA helps in quick actions. When you have EMA as the reference point, you know what side of the market you have been trading. When the stock trades below the EMA, certainly it is the time to short the position. If it trades higher than the EMA, then entering long is always better. Nevertheless, these statements are quite basic. While deciding about trading long or short, you will undoubtedly consider several other aspects as well. 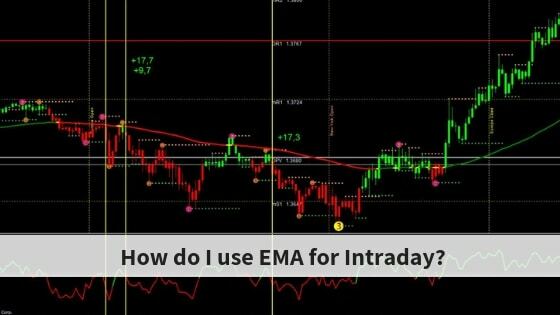 How to use EMA effectively for intraday trading? As mentioned earlier, the EMA is one of the popular strategies in stock trading. In fact, some of the intraday traders do trading on the basis of EMA. It becomes their primary trading strategy. Fundamentally, the intraday trading relies on choosing a short-term EMA and a long-term EMA. The trading decision depends on the relation of short-term and long-term EMA. In the case of intraday trading, not only the decision should come fast, but it has to be accurate as well. There is no scope for holding the position. It has to be square-off by the end of the trading session. Hence, following EMA is quite helpful. Whether you are a novice or a seasoned trader, the exponential moving average is useful for all. When you trade into stocks, nobody can say that the strategy followed by him is the best in the world. It is impossible to make such a strategy because the market is incredibly volatile. However, concepts like EMA can help in deciding in a much-informed manner rather than playing blind.